Podemos ver que la tabla de Guerra Eterna sigue intacta, habrá que ver si han retocado alguna de las misiones, ya que no le vendría mal a La Reliquia. La segunda tabla es nueva, y de momento no se sabe nada de ella, solo que se incluirá los Objetivos Tácticos de los que hablaremos a continuación. Eternal War Mission Table is the same that in 6th Edition, but we don’t know if they remain unchanged, it would be nice if they clarify The Relic. 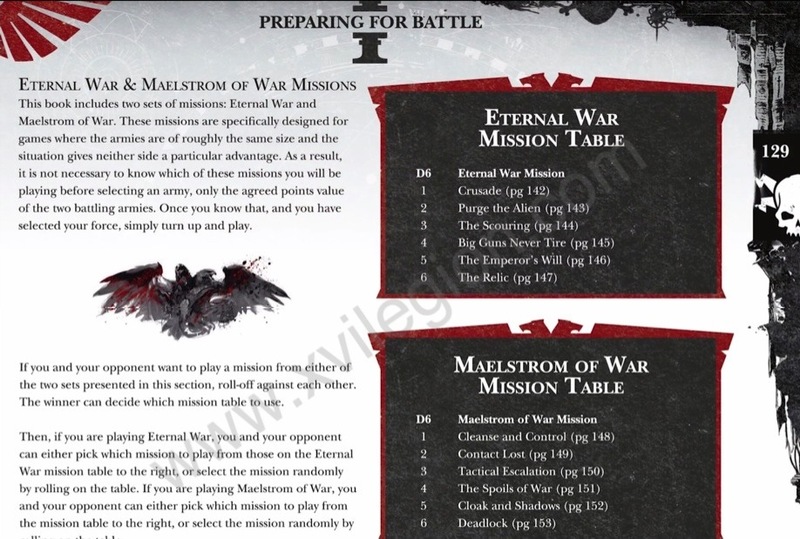 Maelstrom of War Table is new and we don’t know anything about it yet, only that you can play with Tactical Objectives. 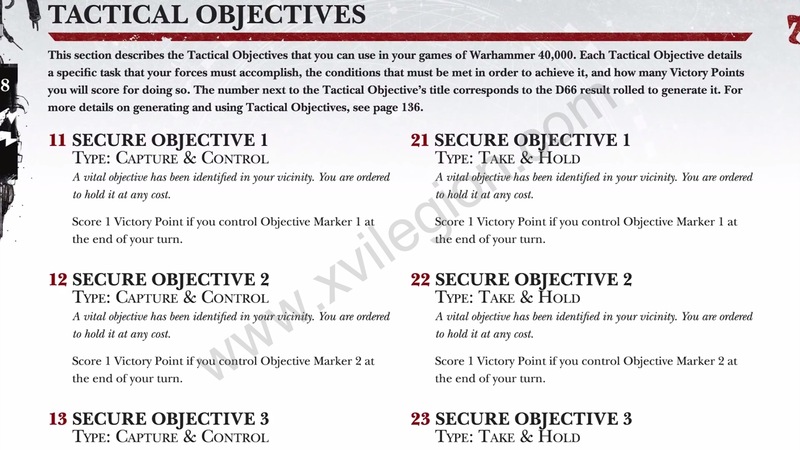 También nos presentan como novedad los Objetivos Tácticos como una forma adicional de conseguir Puntos de Victoria en la tabla de misiones de Maelstrom of War. Es tan sencillo como tirar cada turno 2D6 para determinar en una tabla un resultado del 11 al 66, el cual corresponde a un objetivo que tienes que capturar, matar, o lo que sea, antes del final del turno, y a cambio te da puntos de victoria. Ésto puede ser un punto muy interesante de cara a la construcción de listas equilibradas. 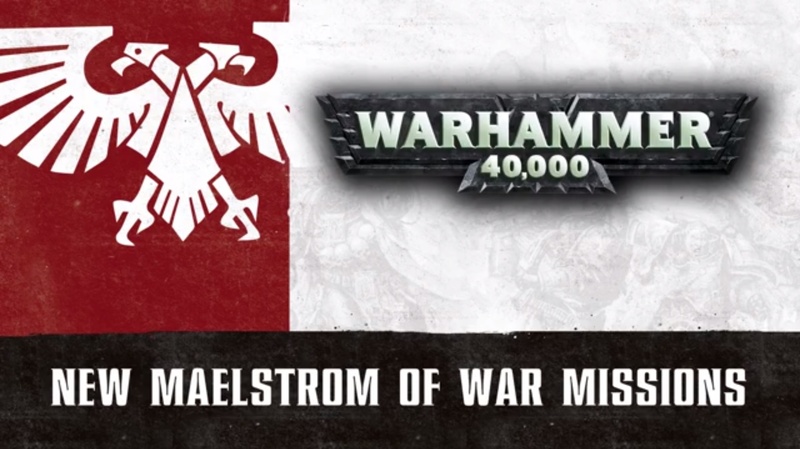 In the video, Jervis also talks about Tactical Objectives, a new way to get Victory Points in Maelstrom of War Missions. 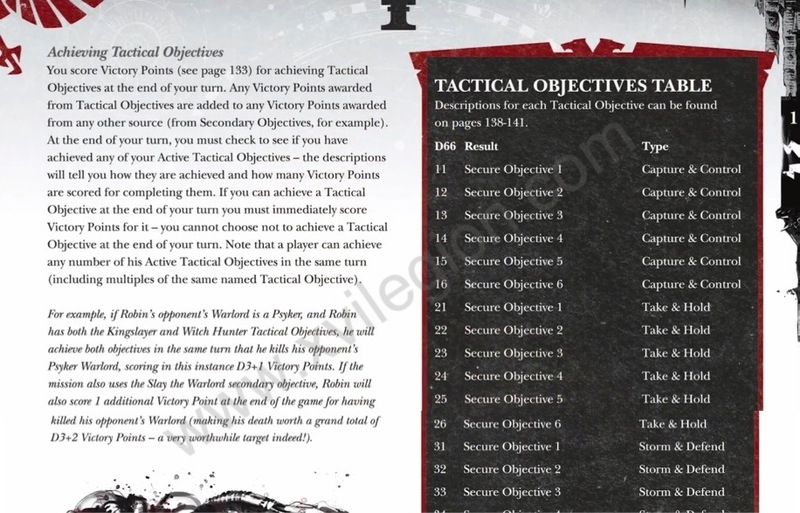 You only have to roll 2D6 to determine a result between 11 and 66, which is an objetive you have to control, a miniature to kill, etc, before the turn ends so you can win those extra Victory Points. Depending on the values, this could be very interesting when writing balanced lists. Básicamente eso es todo, os dejo el vídeo a continuación. That’s all folks, here you have the video. This entry was posted on Wednesday, May 14th, 2014 at 11:44 am	and tagged with Games Workshop, News, Novedades, Warhammer 40k and posted in News, Novedades. You can follow any responses to this entry through the RSS 2.0 feed.